Chapter 4. Testing with Jest. Debugging with Winston. Transactional emails. In-app notifications. Chapter 4: Testing with Jest. Debugging with Winston. Transactional emails. In-app notifications. As our app grows, it takes more time to test our code. When the app's codebase gets large and interconnected, manual testing becomes more time-consuming. To stay productive as a developer, we can create automated tests. You can write a test as small as checking one single object/function (unit test) or as complex as checking multiple interconnected objects (integration test). More on test types. In this subsection, we get familiar with automated code testing. As an example, we want to test if our code generates the proper slug in different scenarios. We placed our slug-generating code at server/utils/slugify.js. You may remember from Chapter 3 that we used the generateSlug() function to generate a slug for the User model. We will also use this function to generate a slug for the Book and Chapter models (Chapter 6). However, for testing, we will focus only on the User model. First, we need to decide where to store our unit test. Jest automatically finds files containing test code. We have to either place our files in a __tests__ folder or create a file with a .test.js extension. We use the second option - for no particular reason. Below, we will create a slugify.test.js file to test our code in slugify.js. 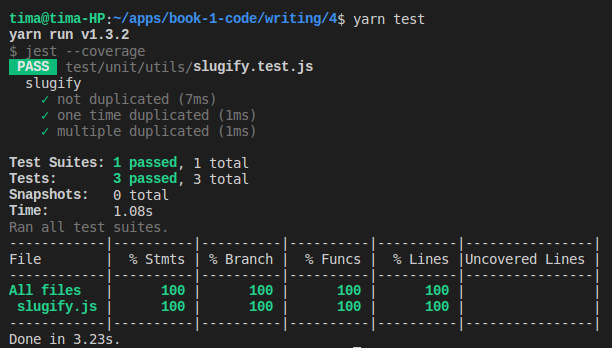 We place the former file into test/server/utils/slugify.test.js. Go ahead and create the new folder and file. To design our unit test, we should look at the generateSlug(Model, name) function inside server/utils/slugify.js and see what this function does. The generateSlug() function does a few things. First, the function converts name into slug using slugify() defined at the top of the file. If a user with the same slug does exist, the function adds a number at the end of the slug and returns this new slug: createUniqueSlug(Model, origSlug, 1. Ok, we understand what the function does. Now what are the scenarios in which we need to test for proper slug creation? Scenario 1. We should test if the function generates the proper slug when no user exists with the same slug. In this scenario, we basically test if slugify() converts name into slug using _.kebabCase(text) (see Lodash docs). Let's call this test no duplication. Scenario 2. We should test if the function generates the proper slug when a user with the same slug already exists. Let's call this test one duplication. Scenario 3. Optionally, we should test if the function generates the proper slug when a user with same slug already exists and another user with that slug appended with -1 exists as well. We'll call this test multiple duplications. This test says that for a user with name John Jonhson, expect the slug to be john-jonhson. The only unknown code in the block above might be expect.assertions(1). The number of assertions is the number of expect().toBe() assertions that you expect inside the test. In our case, the number of assertions is one. By specifying expect.assertions(1); - we tell Jest to call that one assertion that we have in the code expect(slug).toBe('john-jonhson-jr-');. Without specifying expect.assertions(1); - our assertion may or may not be called. If we specify the wrong number of assertions - our test will fail. When the number of assertions is 2 or more, use expect.assertions(number) to make sure that all assertions are called. You can read more about expect.assertions(number) in the Jest docs. MockUser returns a user if the generated slug does match a value from the slugs: ['john-jonhson-jr', 'john-jonhson-jr-1', 'john'] array. MockUser returns null if the generated slug does not match any value from the slugs: ['john-jonhson-jr', 'john-jonhson-jr-1', 'john'] array. Think of this slugs array as an imitation of MongoDB - our database has 3 users with the slugs john-jonhson-jr, john-jonhson-jr-1, and john. This setup for a database may look confusing, and it is. Let's discuss 2 examples to better understand the setup. If user does not exist, origSlug is indeed original and becomes our user's slug. origSlug is not original, so the createUniqueSlug() function adds -1 to the john slug, thereby outputting john-1. Alright, now that you know how tests work - it's time for testing. 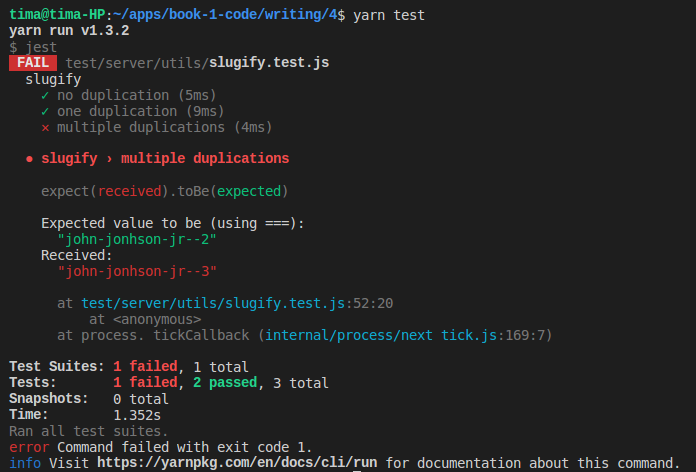 From this jest report, we see that our test suite called slugify passed. This suite consists of three tests: no duplication, one duplication, and multiple duplications. In this case, our generateSlug() function failed the test because it generated john-jonhson-jr-3 instead of john-jonhson-jr-2. Don't forget to go back to server/utils/slugify.js and fix the code to pass all tests. One final note on Jest - saving reports is easy. We simply modify package.json as follows. You should add the .coverage directory to your .gitignore file to exclude it from your remote repository on Github. In some situations, integration tests are more appropriate than a group of unit tests. In our app, we theoretically can write an integration test that simultaneously tests static CRUD methods in our Book or User model. In this subsection, we will set up simple logging with Winston. Winston logging allows us categorize server logs by priority. Why is this useful? With a logger such as Winston, we can output a particular level of messages in development mode but not in production mode. For example, we may want to see error and warning messages in our local app (locally, or in development mode, you see server logs in your terminal) but only see error messages in the logs of our deployed app (in production mode, you log in into your remote server). Winston helps us achieve exactly that. Once we set up Winston logger, instead of using console.log() for all server logs, we can make some messages more important. For example, errors messages (logger.error()) are more important than non-critical info messages (logger.info()). You may use some of your info messages for debugging. In that case, you should not log these messages on your production server, but you also don't want to delete them manually before each deploy. You can achive that by configuring Winston to output messages with certain level of importance.